With their big, bright, yellow bloom, the sunflower can turn open fields into works of art. In addition to improving the landscape, sunflowers contain edible seeds that are packed with flavor and essential nutrients your body needs for good health. Whether enjoying them as a midafternoon snack or as a crunchy addition to your garden salad, sunflower kernels offer many benefits. Sunflower seeds are rich in nutrients that support good health, including fiber, vitamin E, selenium and B vitamins. Enjoy unsalted, shelled sunflower seeds to get the benefits without excess sodium. What Are Those Sunflower Seeds? You may be surprised to learn that sunflower seeds aren't actually seeds, at least from a botanical point of view. Because the seed develops from a flower, it's technically considered a fruit. And the seed itself is called a kernel. One species of sunflower, which has the ability to grow as large as 12 inches in diameter, can have as many as 2,000 sunflower kernels. That's enough for you and the birds that love to eat them. When it comes to nutrition, sunflower seeds can boost your intake of nutrients. The tiny kernels are rich in healthy fats, fiber, vitamins and minerals. The 1-ounce serving of sunflower kernels also meets more than 10 percent of the DV for several of the B vitamins, including folate, niacin, pantothenic acid and vitamin B6. While the seeds are high in fat, most of the fat comes from heart-healthy monounsaturated and polyunsaturated fats. The American Heart Association recommends most of the fat in your diet should come from these healthy fats. When looking for healthy food options to add to your diet, it's useful to compare nutrition information to similar foods. Black sesame seeds have a rich, nutty flavor and make a delicious addition to homemade bread and muffins, as well as yogurt and avocado toast. When comparing black sesame seeds nutrition to that of sunflower seeds, you can see that there's very little difference in calorie, fat, protein, carbs and fiber content. However, black sesame seeds are a much better source of iron and calcium than sunflower seeds. A 1-ounce serving of sunflower seeds meets only 6 percent of your DV for iron and 2 percent of your DV for calcium. While it's rare to be deficient in vitamin E, according to the Office of Dietary Supplements (ODS), Americans may not be getting enough of this essential nutrient in their diet. Vitamin E plays a number of important roles in your body, including immune system support and regulating gene expression. The fat-soluble vitamin may also offer protection against cardiovascular disease by preventing the buildup of plaque along blood vessel walls and the formation of blood clots. But what vitamin E is best known for is its antioxidant power. The fat-soluble vitamin helps prevent the formation of free radicals during fat metabolism, and may help protect you from chronic diseases, heart disease or cancer. The recommended dietary allowance (RDA) for vitamin E for adult men and women is 15 milligrams. One ounce of sunflower kernels contains nearly 7.4 milligrams, meeting nearly half your daily needs. You may not give much thought to the trace mineral selenium, but it's an essential nutrient that your body can't manufacture on its own and must come from outside sources, including food or supplements. This tiny nutrient is needed for reproduction, formation of DNA and thyroid hormone metabolism. But like vitamin E, selenium is best known for its antioxidant powers, protecting your cells from free radical damage and the onset of chronic disease. Most Americans don't have a hard time meeting the RDA for selenium, according to the ODS, which is 55 micrograms for healthy adult men and women. A 1-ounce serving of sunflower seeds contains 22.5 micrograms, meeting nearly half your daily requirement. The B vitamins are a group of eight water-soluble vitamins that play a vital role in many body functions, including turning the food you eat into energy. They also keep your skin, nervous system and eyes healthy. Your body can't store B vitamins, which means they need to be a regular part of your daily diet to keep your body running at its best. Sunflower seeds contain seven of the eight essential B vitamins, lacking only vitamin B12, which is only naturally found in animal foods. The nutty seeds are an especially good source of folate and vitamin B6. Both of these vitamins are needed for the metabolism of protein and the production of red blood cells. Women of childbearing age need to include folate-rich foods in their diets to protect against neural tube defects in their children. Sunflower seeds are an exceptionally good source of vitamin B5, which is more often referred to as pantothenic acid. Adults need 5 milligrams of this essential vitamin every day, and 1 ounce of sunflower kernels contains 2 milligrams. One nutrient many Americans miss the mark on that offers many health benefits is fiber. It's estimated that Americans consume about 17 grams of fiber a day, but need anywhere from 21 to 38 grams, depending on age and gender. Fiber is a type of carbohydrate your body can't digest, and it passes through your stomach, small intestines and colon relatively intact. It aids digestion by adding bulk to your stool, making it easier to pass. Fiber also helps keep your digestive system in good shape by clearing out the waste. Meeting your daily fiber needs may also protect you from conditions that affect your digestive system, including hemorrhoids, diverticular disease and colon cancer. But that's not all. Getting more fiber in your diet may help lower your cholesterol level, protect against heart disease and help you maintain a healthy weight by keeping you feeling full longer, so you eat less. One ounce of sunflower seeds contains 3.2 grams of fiber, meeting 8 to 15 percent of the recommended needs. When adding more fiber-rich foods to your diet, like sunflower seeds, be sure to take it slowly and drink plenty of water. As mentioned, fiber goes through your digestive system intact, and adding too much fiber too soon may overwork your system and lead to belly pain, gas or constipation. What you eat — or don't eat — is a major part of managing your diabetes, which is a chronic health condition that causes your blood sugar levels to be higher than normal. Nuts and seeds are considered a healthy addition to your diet for diabetes. In fact, making sunflower seeds a regular part of your diet may help improve blood sugar and lower blood cholesterol. A 2016 study published in the Journal of Chemical and Pharmaceutical Research investigated the effects of daily consumption of a 1-ounce serving of sunflower seeds on blood sugar levels and cholesterol in a small group of postmenopausal women with Type 2 diabetes. The researchers found that regular consumption of sunflower seeds improved blood sugar and raised HDL cholesterol, which is the good cholesterol. 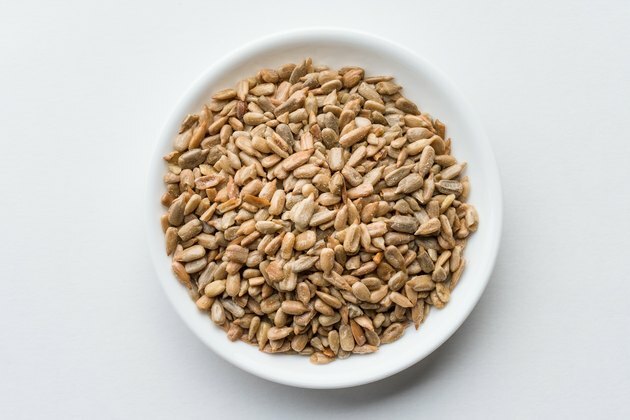 Sunflower seeds certainly make a healthy addition to your diet, but there are certain things you need to be aware of when adding these nutritional nuggets to your diet repertoire. Sunflower seeds may be an excellent source of healthy fats, but those fats make the seeds a very concentrated source of calories. While you may enjoy snacking on the flavorful seed, eating too many may tip your calorie scale in the wrong direction and lead to weight gain. To keep calories in check, don't snack out of the bag. Instead, measure the 1/4 serving and put your seeds in a bowl for snacking. Sunflower seeds aren't a common food allergy, but allergic reactions to the kernel have occurred. If you develop hives, tingling in your mouth or an itchy throat after snacking on your bowl of sunflower seeds, then you may have an allergy. Stop eating right away and call your doctor for an evaluation. If you're adding sunflower seeds to your diet to improve your health, you're going to want to skip the seeds that come presalted. A 1-ounce serving of dry-roasted seeds with salt can have as much 1,700 milligrams of sodium. The Dietary Guidelines recommends you consume no more than 2,300 milligrams of sodium a day. That 1-ounce snack meets more than 70 percent of the recommendation. Consuming too much sodium may increase your risk of high blood pressure or heart disease. Cadmium is a toxic heavy metal found naturally in the soil. Smoking, car exhaust and phosphate fertilizers are environmental sources of cadmium. Overexposure to this heavy metal may increase your risk of cancer or affect lung, kidney or bone health. Unfortunately, certain plants uptake more cadmium from the soil than others. Sunflowers are one of those plants. However, you may be able to safely consume 1 ounce of seeds every day and not experience any toxic effects. There's no doubt about it: Sunflower seeds make a yummy snack between meals. Their fiber and fat content can certainly keep your hunger at bay. But there are many ways you can incorporate sunflower seeds into your diet beyond a simple snack. Mix your sunflower seeds with other nuts and dried fruit for a sweet and savory treat. Add the seeds to your dinner salad for a nutrient boost. Stir sunflower kernels in your pancake batter to add flavor and crunch. Sprinkle the seeds on top of your muffins or bread before baking. Saute sunflower kernels with green beans and olive oil to add flavor to your green-veggie side dish. Use sunflower seeds to make pesto. Add sunflower seeds to your avocado toast with your black sesame seeds for crunch, flavor and a super boost in nutrition.